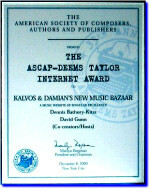 Kalvos & Damian began creating composer webpages in September 1995, and for most of the composers we featured as guests, K&D was the only source of information, photos, music clips, scores. That time is past. As the entry requirements, knowledge demands, domain charges, and disk costs of creating and maintaining websites plummet, composers have taken to building their own sites, or publishers or record labels have created rich and interesting sites which match the composers' styles. Though K&D will continue to build pages that contain basic information, music selections, interview clips, essays, special work, and odd photos taken by Kalvos's rogue camera, the depth of information will be left now to the composers who have their own sites. In the realm of composer web presence, we feel we've served our purpose.